So, we're into week 2 of the Skinny Debt Diet (SDD), and there are 23 members and 10 discussions so far in our Skinny Debt Dieters group over at Wesabe. It's very cool, and there have been some really awesome tips and insights. The gist of the SDD is four categories: food, finances, fitness, and feelings of tips and community support to help boost your financial wellness and help you physically and fiscally since their is such a strong tie between health and money. Can you not eat at restaurants for one month? Find out what one big factor keeps people hooked to eating out, and it isn't convenience. Tips on decluttering your finances. Throw a dinner party instead of eating out at restaurants with friends. 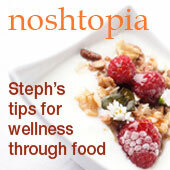 Besides eating cheaper you can eat healthier and have good bonding time with pals which boosts emotional wellness. If you have outta-sight-outta-mind issues with paying bills, create a calendar of due dates and hang on your wall next to your computer. Look into "Community Supported Agriculture aka Organic Farm Share" to save on produce and organics. chattygirlnic did a month of no buying anything made in China, and discovered just how much is made in China. I think I might be scared to find out. 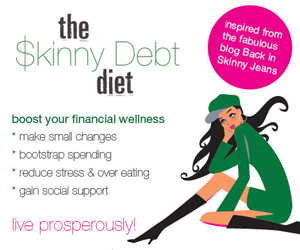 Stop by our Skinny Debt Dieters Group, and please feel free to start a discussion and to chime in. Our Wesabe group is absolutely free, spam free, and anonymous if you want. I'm really loving all the tips and discussions. People are so cool there!